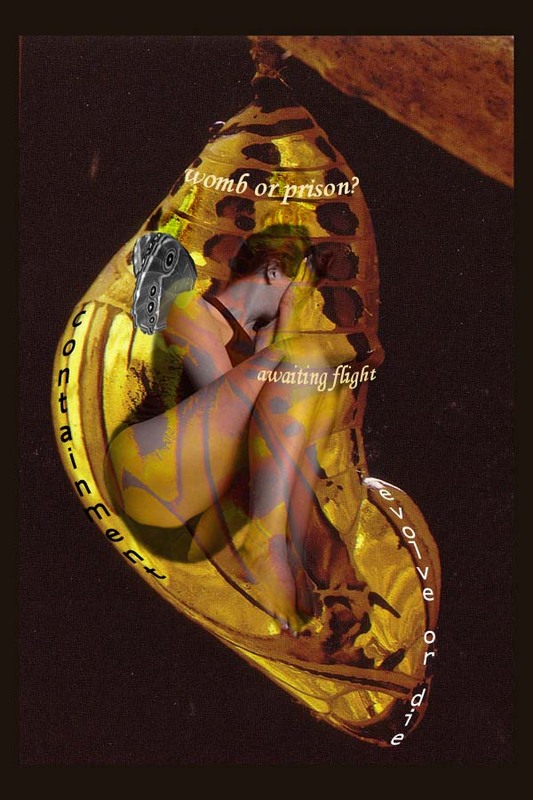 Working on an image of myself in my safe place, a cocoon I spin of golden ribbon and God fills with a warm rosy light and love where I can never be hurt. Strange to see almost the same image. I am being transformed by the death of my 24 yr old son last fall. becoming less ego, more light. I am interested in using a modified version of this image for a non-profit project that I am working on. I am wondering if you are open to this possibility. It’s an empowerment summer camp for teens. I will happily credit you on the website and any print materials, and submit the modifications to you for approval. We have some small budget that we could also give you an honorarium for the usage. Hi D, I just discovered your post from a year ago! If I can still be of assistance, please tell me. Sorry I never saw it then. Hi, I am looking for a logo for a business venture. I’m interested in a butterfly similar to the one you have of a woman in a cocoon. I would love it if you could create something for me along the lines of cocoon to butterfly of a woman. Very similar exept with a little more of the butterfly in the picture, and could you do it with a woman of color. Very tasteful and classy. Out of all the pictures I’ve looked at this piece caught my eye and held my attention. It is very good. Please drop me a line at my email to let me know if you can do this. My mother has emerged from her cocoon of mourning; you see it has been two long and painful years since her husband has passed away. The excitement of my mother’s renewed spirit and lifted self-esteem from her recent breast reduction surgery has made her a butterfly and I feel like a cricket that hops after her. I have feelings of fear and concerns of what our future holds, will she remarry? Our roles are reversed now, she used to dress me and see me off to school every morning with a smile; now I am her stylist. Her faith allows her freedom to dance on the fine lovely strands of grace and the naivety of a teenager’s heart. It is seven-thirty in the morning; a soft and girlish voice says “do you have time to you fix my hair?” I leap to her aid. With lightening speed and proud new parental like notions, I begin to style her black soft curls. I am basking in this adventurous, exciting yet confusing ritual. Too many bottles full of half truths have dripped on my neatly written instructions that are illegible. I wrote the night before, I am secretly smiling inside. She doesn’t need them; this is our moment. I followed here from a visit on my blog and glad I did. The sentiments and willingness to explore thought and feeling on this page are heart-stopping. Love your work, your site, thank you for being so generous and sharing so much of yourself and your work. I am taking an altered art book/journaling class. i had a recent dream about a butterfly in my hand, i was looking for a branch to put the butterfly on to dry its wings so it could fly,,,, when I awoke I did a lot of journaling about the dream and my own need for a place to let my wings dry so I can fly. Today i am working on the journal and needed a cacoon image,,,, when I googled cacoon, the first place I went to was yours,,,,WOW,,,God has blessed me today! I really LOVED your image of the “cocoon”. I have written a poem, through the Holy Spirit called “New Life”. I would love to have your permission to put your image on the inside of the ‘cards’ that I make. Actually, they are no more than paper ‘cards’ that I write poems on and put them in my church hall for all to read, who may hear a one from The Holy Spirit. I am always looking for new images and I came across yours. It will only be a small image at the top of the page where my poem starts, or maybe on the front. Not sure yet. Depends on what you say. At any rate, this image was perfect for my poem! I pray that you allow me to use it. I do not sell them but I will give you credit on the back of the ‘card’ itself along with my own copyright of the poem. Thanks for sure a wonderful image of Life. The following is dedicated to my son Seth Chacon: After I read it to him, he said it was his favorite writing. He loves for me to read it to him. He says it brings him so much comfort. It is such an honor to be his mother. He loves the Lord God so much. Last year at the age of 13, and although we are not members of that particular church, he preached an anointed Christmas message, before the college students at a Baptist University in San Francisco. I am so proud of him. It comforts me to know that he has his own relationship with the Lord Jesus Christ. Awesome! Ah, it is so warm in here. I feel so cozy. Where am I? What is this place? I feel so safe. Thank you God, Could there be a better Place? Today, I will see my mommy’s face! We too will mature and out grow this world. As the day came for the unborn child to leave its mother’s womb and not just hear her familiar voice, but to see her face to face we too will one day see the Holy face of Jesus: The familiar voice of our savior of which we heard while we were yet in the womb of the church in this world. “Sometimes do you feel your life change from “Cocoon to Butterfly”? Can you feel something within yourself going through a subtle gestation process? Where changes are occurring, perhaps a new direction your life-yet it is unseen?